Freshly Thrown Clay Bowl, at the Leach Pottery, by Warren MacKenzie. Clay is the most amazing natural material. When wet, it can be moulded by hand and machine to make anything you can imagine. By firing dry clay in the kiln, it is transformed into a hard stone-like material. 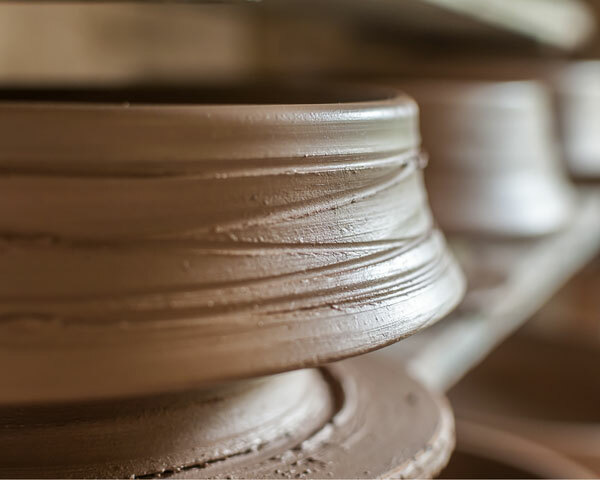 Because clay is so flexible and so readily found, people have been using it as a material for many thousands of years. ‘Clay: That Continuous Material’ takes a closer look at the material we use every day. The story of clay will be told across the Leach Pottery site, from the pioneering early days of the Leach Pottery, which made its own clay using materials delivered over the wall, to how clay is formed and its place in Cornwall’s geology. The exhibition offers a mix of fun and educational family activities, new visitor materials in the Old Pottery, and an exhibition about clay in the Cube Gallery. The exhibition is further enriched by Aaron Angell’s residency in conjunction with our partners at Tate St Ives: he will be using the Leach Pottery as a base for making new ceramics from June - September 2017. We were lucky enough to have support for this exhibition from Clayworks (who are based in St Keverne, Cornwall) to create a clay wall showcasing the versatility of clay. The specialist plasterer Jules also very kindly donated his time for free. We were also supported by Imerys, who were kind enough to let us have a tonne of raw china clay from their quarry near St Austell.